Naturally, there is a tiny space between teeth and the surrounding gum tissue. The depth of this space in healthy state varies from 1-3mm. This space is known as gingival sulcus which can be easily cleaned by proper brushing and through regular hygiene appointments. If the bacteria start populating the sulcus, overtime tissue breaks down and the sulcus gets deeper and turns into periodontal pocket. As pockets get deeper than 4-5 mm it becomes more difficult to remove the bacterial biofilm and tar from the root surfaces. Tooth bush bristles can never get to the bottom of those pockets and even it will become difficult to do proper cleaning using the hygiene instrument. In many cases bacteria are constantly being left behind deep in the pockets and they will continue to cause more inflammation leading to more tissue breakdown. In these situations, the only predictable way to gain access to the subgingival biofilm is via pocket reduction surgery. The objective of pocket reduction surgery is to remove the disease-causing bacteria together with the infected gum tissue around teeth with the end result of achieving shallower pockets that can be easily maintained. This procedure is done under local anesthesia and involves some gum trimming and often minor bone filing. For anxious patients, this procedure can be done under sedation. Thorough root cleaning is then performed while having direct unobstructed access to the root surfaces. 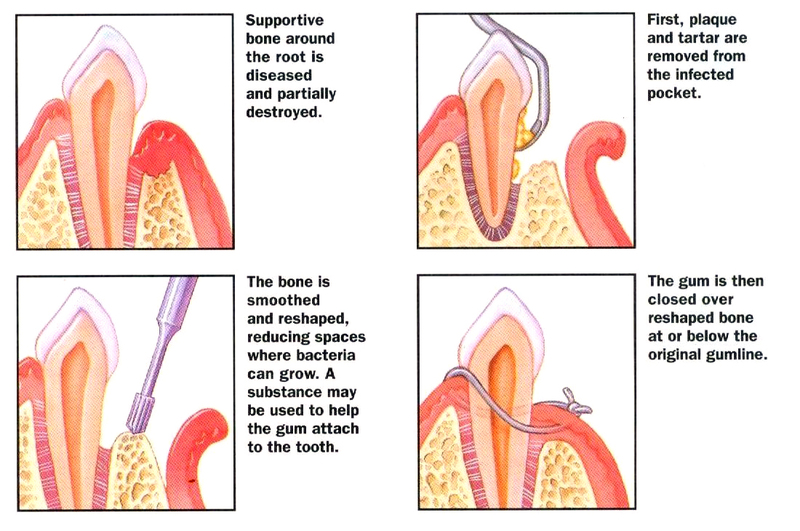 In some cases periodontal regeneration may be attempted by using tissue stimulating proteins and/or bone grafts. At the end of the surgery dissolvable stitches will be used to facilitate healing. After the surgery it is very important to follow the post-op instructions and to receive regular maintenance care at a frequency determined by your periodontist.